ATLANTA -Kik Messenger, a smartphone app popular among younger teens, is on the defensive following the stabbing death of a 13-year-old girl in Virginia who told friends she was using Kik to connect with an 18-year-old man. Like Instagram, Snapchat and other messaging rivals, Kik provides free, easy and instant connections to other users anywhere. Kik enables people to message each other one-on-one or in group chats, and to share photos, videos and other content. By enabling people to identify themselves only by an invented username, it provides more anonymity than services such as WhatsApp, which connect people through their phone numbers. Law enforcement officials say the application is dangerous in part because parents cannot reliably prevent anonymous strangers from contacting their children if they use it. Kik made an updated guide for parents available on its website following the arrests of two Virginia Tech students in the slaying of Nicole Lovell, a seventh-grader who lived two miles from their campus in Blacksburg, Virginia. Kik also pushed out an update to the app, available on Google Play and Apple's iTunes store, and had Apple raise Kik's age-appropriate rating on Monday from 9+ to 12+, closer to its requirement that no one under 13 use the service, terms that are shared by Kik's rivals. "We are trying to educate all users, parents and teens," company spokesman Rod McLeod told The Associated Press on Wednesday. The parents' guide stresses that teens between 13 and 18 need a parent's permission to use Kik, but there's no technical way to enforce that or to prevent a child from entering a false birthdate, McLeod acknowledged. "A lot of blame has been placed on Kik in the last two days," McLeod said, but he noted that many other social media networks operate the same way. "It's a problem that's spread around the industry," he said. 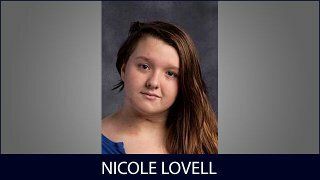 Nicole Lovell had apparently accounts on Kik and other social media services against her parents' wishes. "She was able, at 13 years old, to go and set up profiles on Facebook that we had no idea about. And a minor should not be able to do that," her father told CBS News correspondent Don Dahler. "We have no idea who they're talking to." Kik Interactive Inc., the privately held Waterloo, Ontario-based company that launched the app in 2010, claims more than 200 million registered users, including 40 percent of U.S. teens and young adults. Investors recently valued their collective stakes in the company at $1 billion. Asked whether making technical changes to remove the anonymity feature would harm Kik's business model, McLeod said. "I think part of the allure of Kik is that it is anonymous." Many parents have vented their concerns on social media since the girl's body was found Saturday. "Attention all Parents: If your child has the APP "KiK" on their phone.......lose it!!" one woman posted on Facebook. "There are a lot of bad elements out there. We certainly saw that in Blacksburg this week," said Adam Lee, special agent in charge of the FBI in Richmond, Virginia. "Kids do all their communication on their phone," Lee added. "It's a lot harder to keep that computer in the kitchen like we used to. They are mobile with their communication. For parents to think they can go in after the fact and see what they are doing is a little naive." McLeod said the company responded quickly when the effort to find Nicole turned to her use of Kik, acting on an emergency FBI request to provide information that the company believes led to the arrests of both suspects. David Eisenhauer, 18, is charged with kidnapping and first-degree murder. His fellow engineering major, Natalie Keepers, 19, is accused of helping Eisenhauer before and after the crime, as well as helping to hide the body. Police have not said whether they have recovered any of their electronic devices. The company's website advises law enforcement that it does not have access to the text of Kik conversations but, with a court order or in an emergency, can provide users' location information, including their device's most recent IP address and timestamps of their chat messages, though not their content. The company also can give authorities some user-provided details, such as name, email address, profile picture and birthdate, but says "this information isn't verified by Kik, meaning we don't have any way to know if it's accurate." Jenkins said Kik's changes do little to alleviate his concerns, since there's no way to verify a user's age or parental permission. "Kids are going to find a way around that ... You can have a 10-year-old with a cellphone claiming to be 18 and be on there," he said. "I don't know that it changes a whole lot in the way things go forward."